"Mitchell L.H. Douglas’s brilliant third collection bears witness to cities full of gunshots, murder, and the people fractured by violence and oppression. These masterful, hurtful poems serve as questions and facts, protests and affirmations in this time of unrelenting danger for black and brown people. Douglas’s poems give us the language we need to persevere and to not lose sight of the unexpected beauty behind the anger and want around us." "It was clearly impossible for Mitchell Douglas to improve on the deftly-honed character sketches of his acclaimed first effort, Cooling Board. But he simply wasn’t fazed by the specter of impossibility. Between these covers are fresh stanzas of drum and muscle, documenting the addictive dramas of colored folk. Every line is threaded with funk and ferocity, conjuring a world that is as relentless and essential as the alphabet." 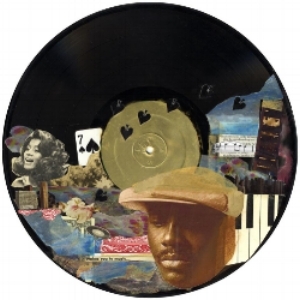 "Roosted at Fender Rhodes piano and veiled beneath a supernatural Apple cap, Donny Hathaway narrated the many rivers of the human heart in un-ironed sweet song. In Cooling Board, Mitch Douglas, our new bard of Black musical memory, hears the call of Hathaway’s piano, peeks beneath the signature hat, then steps bold into the river of Hathaway’s iconic sound. This is Mitch Douglas’ neophyte troubadour baptizing. The poet is drenched, then, set sailing, in what is found on bank and shore of Hathaway’s life. The poet crafts a bright theatre of response, a rhythmic, un-authorized, long-playing poem on the life of the Chicago/St. Louis genius, who gave us notes we had never heard before and will never hear again. Those of us raised on his black octaves know that this 8 track of a winding story cannot bring Hathaway back to us, but it does peel our hearts back far enough to feel the pouring in of both the critical Eulaulah and the unusual ukulele of Hathaway’s piercing balladry. Douglas does his poet-job. He makes us hunger for Hathaway, he makes us reach for his every hummed-up and moaned-out word, underwater, with our ears sloshing full of Hathaway’s high notes, holding our breath to the end."